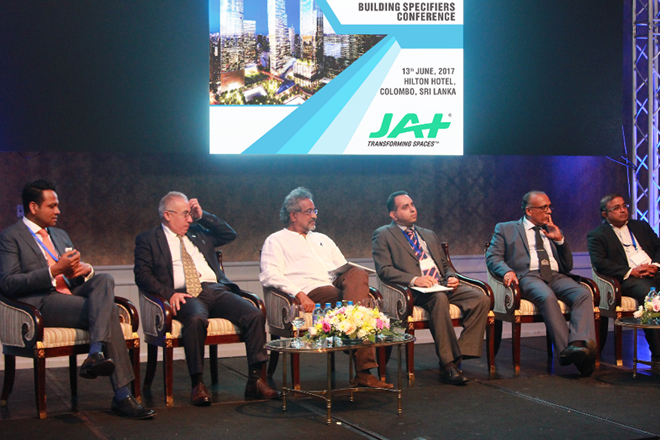 JAT Holdings, Sri Lanka’s award-winning conglomerate was a title sponsor of the highly successful Building Specifiers’ Conference 2nd Edition, which was held recently in Colombo on the 13th June 2017. This second successive endeavor was held within a short span of five months after the pioneering Builder Specifiers’ Conference in January this year, saw a stellar gathering of the delegates involved in every sphere pertaining to the building industry. Among them were architects, structural engineers, civil engineers, consultants, students, contractors, developers, builders, quantity surveyors, project managers, officials in Government Departments, fabricators to University academics. “JAT is proud to be a part of an event of such magnitude, which has created a strong foundation for the trail blazers of the building industry to share their expertise. The escalated focus on building requires a strong platform, enabling all involved in this sphere to ensure that ethical, innovative methods and standards are meticulously adhered to in terms of infrastructure development. This unique event puts our island squarely on the forefront of the map of rapidly flourishing nations with a purposeful and futuristic approach to development,” said Aelian Gunawardane, Managing Director, JAT Holdings (Pvt) Ltd. This second conference concentrated primarily on the sphere of building development; enabling the audience to enhance its understanding on the subject of construction which is a pre-requisite for the inculcation of methodologies which are both professional and sustainable; paramount to the success of the development of high-rise buildings with attention to detail. Since their first appearance in the 19th century, the design and construction of high-rise buildings have undergone a phenomenal transformation. Subsequently, the conference addressed crucial factors which impact the rapid growth in the ever evolving skyline synonymous with modern high-rise construction. With aluminum, glass facades and superlative coatings being essential elements in the aspects of technical functionality as well as aesthetics, this topic became one of the critically discussed topics addressed by a distinguished panel of façade experts from around the world. In addition, the internationally acclaimed group of experts covered a vast spectrum of issues related to building facades, which was both informative and educative in its scope. Some of the key areas that were given prominence were design processes, adaptive façade systems (kinetic intelligent, dynamic etc. ), bio-climatic design, solar performance (day lighting, glare, BIPV, shading, strategies etc. ), high performance facade applications, fabrications, resilience, facade futures, education in building facade design technology and science, textile membrane facades, metal curtain wall systems, retrofit, heritage conservation and preservation, high-performance facade applications, novel facade systems, energy and carbon, regenerative design to name just a few. Sri Lanka’s construction services sector has witnessed a boom in recent years mainly in the property development sector due mainly to the expanding demand for affordable high-quality living spaces fueled by rapid economic development, urbanisation, increased consumer spending, government growth and development plans implemented by the Urban Development Authority. This pro-active role has increased the exigency for the rapid development in infrastructure facilities on a level of mass construction in the form of houses, high-rise buildings, condominiums, universities, schools, roads, highways and bridges. It was these factors which spawned the initial Building Specifiers’ Conference which was held on 31st January this year.